Welcome to the Baby Jogger City Versa Stroller Giveaway! The Baby Jogger City Versa Stroller from PishPoshBaby is a full-featured, fast-folding, all-in-one stroller. The padded seat is reversible so you can have baby face you or face the world. Available in Black, Green, Silver and Red, the City Versa can also fold easily with one hand no matter what direction the seat is facing! Features an all-wheel suspension system, adjustable handlebar, hand-operated parking brake, dual swivel front wheels for precise maneuverability, 8" quick release EVA wheels, adjustable footwell support for passenger comfort, a large multi-position canopy with peek-a-boo windows, a seat back storage compartment, large under seat basket, adjustable 5-point harness with shoulder pads and buckle cover, and a removable auto-lock to keep the stroller folded during transport and storage. Retails for $229.00. 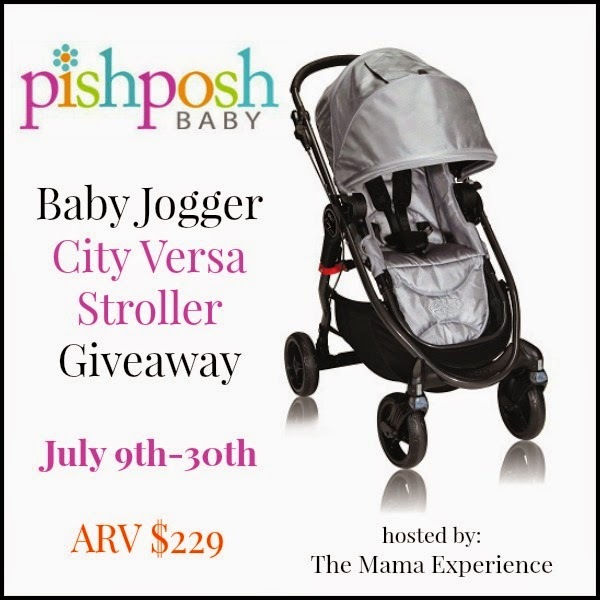 One lucky reader will win a Baby Jogger City Versa Stroller from PishPoshBaby! Giveaway ends July 30th at 11:59pm EST and is open to US residents, ages 18+. Just enter below on the Rafflecopter form. Good luck! So excited to stroll through the farmers market with the amazing shade feature protecting my boo from harmful uv/uvb rays! I'd go everywhere with this, especially to my teenage daughter's soccer games that will be starting pretty soon.